https://www.cutoutandkeep.net/projects/baby-shower-gift • Posted by "Green"
Depending on the size of the baby blanket you decide to use, estimate the size of the gift basket you're making. With that estimate calculate how big you cut out the cardboard, you will need to cut out and oval and 2 rectangular strips. One of the strips has to be the circumference of the oval. You will tape it together resembling a basket. Wrap the blanket around the basket folding in certain corners to give the shape of a basinet. Tie the base with curling ribbon and tape down anything the is loose. Roll up 5 diapers in to the shape of a wheel, tie with curling ribbon on both ends. (repeat 4 times) Tape down on to the cardboard which sould be wrapped in tissue paper color or your choice, to match of course. 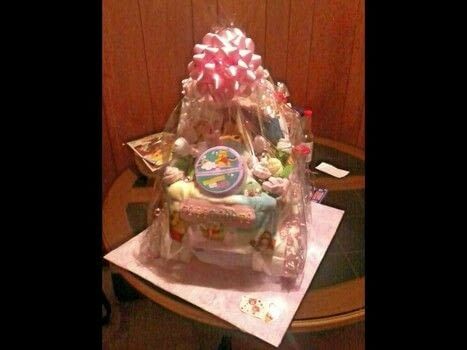 Fill the inside of the basket part with toys, baby bottles, and roses(made with the baby socks and washcloths) . Wrap in clear plastic wrap and tie with a bow and curling ribbon. 1 roll of Curling Ribbon any color to match.